Cabinet Cabinet made of plywood. Super Mario Bros. is a pinball machine licensed by Nintendo and developed by Gottlieb. It was released in the U.S.A on April 25, 1992 and a total of 4,200 units were manufactured. The machine is designed by Jon Norris, with artwork by David Moore and Constantino Mitchell. 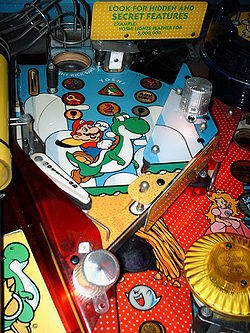 It was the first pinball machine produced by Gottlieb to use the Dox Matrix Display; a screen on the bottom of the lightbox which keeps track of the current score and can also display various animations during gameplay (such as Mario running towards a Castle). Despite the name "Super Mario Bros.", the machine appears to share a majority of its artwork with Super Mario World, released two years before. A second pinball machine in the Super Mario Bros. series was released in June later in the year under the name Super Mario Bros. Mushroom World, which seems to be based on Super Mario Bros. 3. This release was intended for commercial operation, a device designed to make money in a public domain. View of the lower playfield. 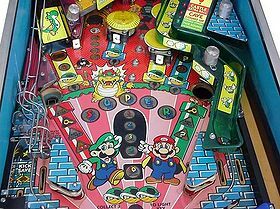 The pinball machine contains many Mario themed interactive features, such as on-field artwork that lights up during gameplay and the main objective of rescuing the princess. There are three flippers; the third found at the top of the playfield on a raised, separate Yoshi-themed area. Underneath this raised area is Luigi’s cave. A blue revolving castle is located at the top of the playfield, which the player is able to "destroy" by shooting at it while "Super Mario". This can be achieved by lighting up the letters that spell S-U-P-E-R, located near the middle of the playfield. The castle has an artwork of King Bowser on the top. A kick save is found on the left outlane. Yellow and blue Warp Pipes on either side of the middle act as slingshots, which powerfully eject the ball soon after it enters. Four sinkholes are seen throughout the playfield, most providing points or a bonus, depending on the situation. Two are seen either side of the field just below the slingshots, one above the third flipper on a raised platform at the top of the playfield and one just in front of the castle. This sinkhole has a plastic tube that runs down to the bottom right hole just above the right slingshot. A wireform ramp leads from the top sinkhole and drops the ball into the left inlane. A few of the sinkholes are able to light up one of the letters that spell S-U-P-E-R. There are three pop bumpers on the top half of the field. These pop bumpers toggle the lights to different types of bonuses the player may receive on the five spot targets. The aim of the game is to become Super Mario by spelling S-U-P-E-R, which then allows the player to shoot for the castle. Destroying seven castles in seven different worlds will rescue the Princess and the player is then able to enter their name and score. They will receive a replay if the high score to date is beaten. All castles destroyed will be carried over to the next game. This makes it possible to begin a game with six castles, and the player will only need to destroy one to win. But the score would be significantly lower in comparison to gameplay throughout all seven worlds. The player is initially given three balls, but more may be gained during play. The Yoshi-themed area seen in the upper playfield. Bomb round – Light the Bob-omb fuse by hitting the left ramp spot target while the bomb insert is flashing. Once done so, shoot the ball into any of the sinkholes to gain 30 million points. The upper playfield sinkhole will also stay lit for the rest of the ball, being worth 20 million points. Mega Bumpers round – Simply hit each pop bumper to score a bonus 1 million points. Yoshi’s Countdown round – Hit Yoshi’s spot target on the raised upper playfield to collect the countdown value, which begins at 24 million and will slowly decrease. The value does not countdown during Multiball (see below section).
! Round – Hit the "!" targets to collect increasingly higher scores. The scores range from 1, 2, 3, 5 and finally 10 million. Castle Extra Ball round – Enter the castle during in this round to collect an extra ball. Cave Count-Up round – Hit the spot targets within the area known as Luigi’s cave. The player collects a count-up value with each hit, which stops at 48 million. Entering a round as Super Mario doubles the value of that round, including extra balls. Each round will only last for about a minute. Once a round has been completed, it cannot be played again during the same game. Completing all six rounds in a game lights Castle Special. To achieve multiball, the player must light 1-2-3-4 in sequence. Each number is situated within a different area of the playfield; "1" is on the left ramp, "2" is the Yoshi target on the raised area, "3" is the right loop shot that feeds the ball back into the bumpers and "4" is the shot made from the third flipper on the raised platform. Once these shots have been made, the player must hit the ball into the bottom left sinkhole to gain the multiball. There are two types of multiball; 2-ball and 3-ball. The latter can be played by being Super Mario when multiball is gained. The object of multiball is to get as many balls in the castle as possible. Each ball in the castle earns a jackpot, which begins at 5 million. As multiple balls enter the castle, the jackpot increases to 10, 20 and finally 40 million. Additionally, this total is increased during 3-ball. The game’s video mode is shown after the ball has entered the castle and the Bullet Bill sequence is complete. The Dot Matrix Display seen on the light box will show what appears to be a classic Super Mario Bros. game, where the player runs and jumps across gaps in the ground with a Goal Pole and castle seen at the end. The right flipper is used to jump, while the left is to run faster. 10 million points is awarded for making it to the end. But if the player is to hold the left flipper in for the whole level, the game will deal 30 million points instead. When the last castle has been destroyed and the ball has drained, Mario will run across the screen towards the castle. If the player is to make him jump, they will receive 30 million points instead of the normal 10. Backglass artwork. Note Wart's appearance here, and that "Bowser" is really a design based on King Koopa from the DiC Entertainment television cartoons. Detail of Bowser artwork. Note the character's blue eyes in this illustration. For a glossary on pinball terms, see here. This predates his first time as Mario in a video game (Mario's FUNdamentals) by 3 years and Super Mario 64 by 4 years. ↑ Internet Pinball Database: Super Mario Bros. This page was last edited on January 5, 2019, at 15:01.